So, pardon me, but I’m going to put a few old posts up here on the new blog for awhile until I can get caught up. If you’ve seen this before, my apologies. If you haven’t, enjoy! I dye a lot of wool. I try to do a lot of other things too! Over the next few weeks I’d like to give you a glimpse of my basic dyeing process and, perhaps, share a few tips along the way. I use a variety of techniques in dyeing the wool that I sell on my website and this is just one, but it’s good basic dyeing. So, let’s get started….. Most of my dyeing is done in the early morning….about 6 AM. Oh! What’s the most crucial item I need to get started on an early morning session in the dye pots???? Yes, you guessed it! It’s that nice big cup of steaming hot coffee ( my favorite is Peet’s Italian Roast…no wimpy Starbucks at my house). For a successful and efficient session of dyeing, planning is really the key. I keep a hand-written journal with a never-ending list of the colors that I need to dye. This helps me to plan the fabrics I need to soak and to be sure I have the proper dyes in stock. All of my dye formulas are stored on computerized worksheets. 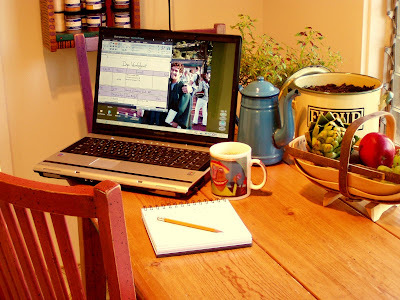 This is a big help in planning and record-keeping. Keeping good track of my formulas and any variations I may make in the formulas comes in so handy when I’m trying to recreate that perfect deep gold a customer bought a year ago who now wants another yard! I keep all of my dyeing implements, dye measuring spoons, wisks for stirring, Pyrex 2-cup measuring cups, citric acid, etc. all in one cupboard so that it’s always within quick reach. 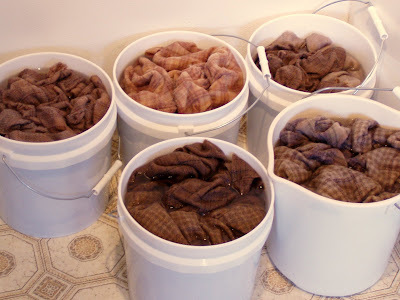 Last night I got all of my wool soaking for the 5 colors I hope to get dyed this morning. 2 yards per bucket; 2 yards per color…… 5 big five-gallon painter’s buckets with 10 yards of wool soaking overnight in warm water and Synthrapol. Many dye books suggest that soaking your wool for an hour or two is sufficient but I find that I get the best results when I’m patient and allow the wool a good, long soak overnight. There really is a difference in the way the wool absorbs the dyes. More in a day or two…. This entry was posted in Dyeing Wool and tagged dye pots, hand dyed wool, how to dye wool on August 8, 2014 by Marita.